Our venerable Britannic majesty has just celebrated 60 years on the throne. Royalty is a subject I’d best avoid when visiting our neighbours, recently retired farmers Paul and Christiane. Christiane buys magazines like Paris Match and avidly follows news of William and Kate, etc., but, if I happen to call in and sit down for a coffee and Paul catches sight of said magazine, he takes me to task on why ‘we’ still have a royal family. I’ve tried explaining (from the fence-sitting position of being neither a royalist nor a republican) that they certainly bring in a lot of revenue, etc., but he won’t have it. I’ve asked whether he’d have us bring back the guillotine, with which they did for their own noblesse: no, he recoils; he just wants them retired off. We have a Queen with a (albeit symbolic) legal role and a working prime minister and the French have a president and a prime minister. “Why do they need two persons then?” I counter. Oh, they do different jobs, he responds, but with a doubt in his voice. I have him on the ropes and ask why the Germans make do with a chancellor and a president, their president being as symbolic and un-politically involved as our queen. Why does the British prime minister correspond with the French president but not the German one? What does the French prime minister do? I sense victory and we start talking about the safer subject of agriculture. We appear to be changing queens. 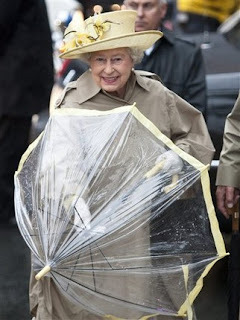 I’m not sure Elizabeth is about to abdicate; I’m referring to our new colony of bees. 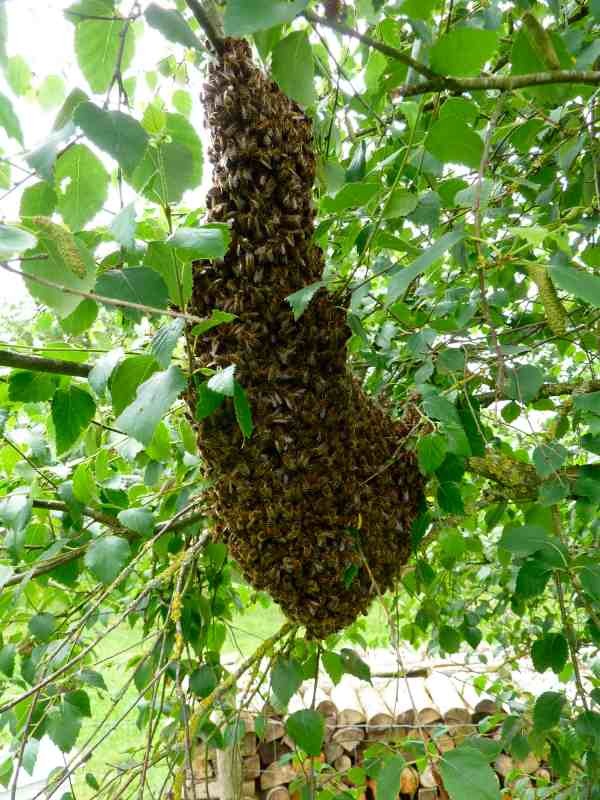 There was a strange to-do a couple of days ago, with a cloud of agitated bees surrounding our hive; I’ve never seen anything like it. As I called Gabrielle on her mobile to tell her, they all started making their way back into the hive. She later rang our Brittany bee expert, Richard and we now think that this may have been a ‘re-queening’ with the new virgin queen exiting for an airborne shag-fest before returning to the hive to start laying. Richard had told us to try to put them back in the original hive. 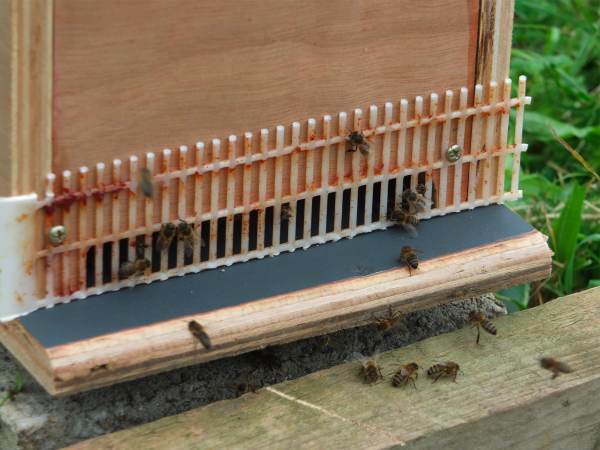 If they were re-queening, then this would work but if there were two queens (think Mary, Queen of Scots and Elizabeth I ) then they’d swarm again and then we would have to put them into another hive. … and swarm again they did, two days later. 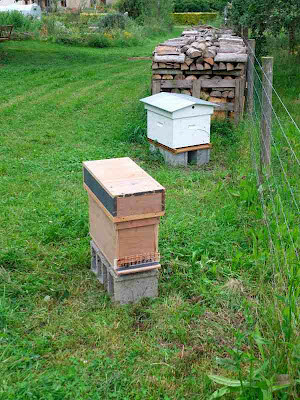 We installed our new mini-hive with just five frames, which Richard calls a nucleus and the French, une ruchette. (Thanks to Andrew, friend and volunteer, who built this from offcuts of exterior ply only a couple of weeks ago.) Same technique but the bees didn’t seem 100% sure, a lot of them remaining in clusters on the outside and underneath. 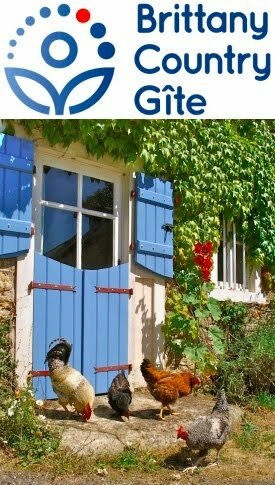 Gabrielle phoned Richard and I called Olivier, who lives and keeps bees in an adjoining village. Both of them are also experiencing bees expressing somewhat unusual behaviour. Olivier turned up within five minutes in a white van that should have had a blue flashing light on top for added authenticity, I reckon. While he was there, the bees did seem to go inside, aided by some gentle persuasion from Gabrielle with a soft brush and so we got some white wine from the fridge to boire un coup, the traditional way to say thank you. Celebrations were perhaps a touch premature and the bees became unsettled again. 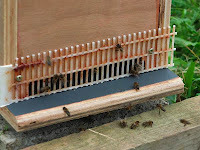 Olivier had given us a strip of plastic grill (cut from an old ‘queen excluder) with the advice to put it across the opening for a couple of days, once we were sure that the queen was inside (the key issue); this would prevent her from leaving again and causing another swarm. Olivier left and the bees did swarm again but this time we let them enter by the top of the ruchette, them filtering down between the frames. They all went in and Gabrielle filled up their feeder with sugar syrup and then had to rush off for a gig with her violin. In early evening, with little activity, I attached the grill to the front. All seems well and we now have two hives of bees. Wow! We have bees now and Pete used to keep them many years ago and had several hives. He says that to stop them swarming....unless you want them to, you have to manage the queen cells.....what do your bee people do? Nice size swarm . The queen may be un mated so still able to exit via the gril. Beekeeping baptism by fire? Well done . A beekeeper managed dress himself in a suit of bees weighing 36 kg (81.6 lbs.) over the course of 2.5 hours. Sheng Zonghong, 43, has been raising bees for 27 years. "I want to break the Guinness Record while bringing attention to what we are doing." Sheng made a circle in a public square and sprayed coal oil along the lines to prevent bees from escaping. Then they arranged dozens of beehives around them with scales at one corner. Sheng's wife and assistants at first moved the queen bees from each hive onto Sheng's body, and then opened the boxes to let the worker bees find their respective queens. 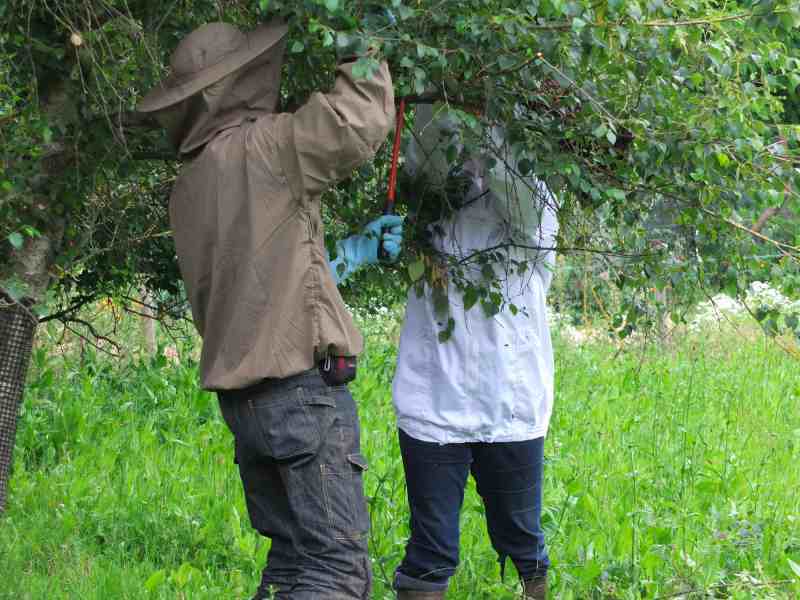 Instantly, Sheng was covered with thick layers of bees. Except his hair, all his body, including his mouth, eye sockets, and nostrils were filled with bees, and Sheng said he had breathing difficulties, but managed to talk to a news reporter. Breaking the previous Guinness record of 31.5 kg, Sheng shouted and tossed the bees onto the ground, then quickly walked into a room and closed the door. 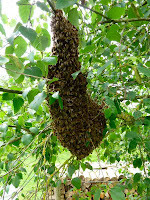 Lots of swarming here too - 11 swarms collected this year, all within a 1 mile radius of where we live. This has resulted in my going up to five colonies from 2 and the rest being given away. Next year, I hope to try a Perone hive on an organic farm near Cambridge. - A brood area 57cm cubed and three supers on top. Put the swarm in and then the next time it is opened up is 15 months later to if we are lucky harvest 200lbs of honey! - but not if the weather is like this year!